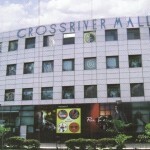 Crossriver Mall is located in the Central Business District of Shahadra, Delhi. With a total Built up Area: approx 2.5 lakh sq ft, it offers 23,226 sq. mtrs. area for retail & leisure. Anchor Tenants are Pantaloons, McDonald’s and Haldiram’s. the Multiplex is operated by Fun Cinemas, while the food court area is 25,000 sq.ft. Its USP as the longest mall in Delhi and NCR is combined with a centrally air conditioned 2,323 square metre atrium and a viable mix of retail, enterainment and commercial attractions for consumers. Its interestingly laid out to provide frontage to each shop from atrium, while a beautiful, state-of-the-art value centre offers visitors the finest fashions, dining and family entertainment options in a beautiful and electrifying setting. Targetting a catchment population of about 5.5 million across Preet Vihar, Rishabh Enclave, Nirman Vihar, Suraj Mal Vihar, Shahadra, Patparganj, Vivek Vihar and Krishna Nagar and Anand Vihar, Crossriver Mall also offers fun games at a splendid gaming zone, which offers the ultimate gaming experience. Average footfalls on weekends touch 40,000 at this mall.